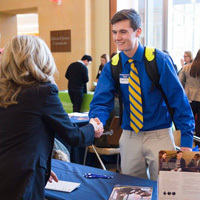 The Walker School of Business & Technology Walker EDGE Office, in collaboration with the Career Planning & Development Center, will host an internship fair for Webster students on Thursday, Jan. 31, from 11-2 p.m. in the East Academic Building, Commons Area. The Walker EDGE Internship Fair enables students to get their resumes in the hands of potential employers who want to hire interns. Companies from various industries will participate. Students are encouraged to RSVP in advance to receive a special attendance gift. Join the Event in Handshake. Click here for the Handshake Student Event Preview. Students are required to dress professionally and should plan to bring plenty of résumés. For questions, please contact the Walker EDGE office at 314-246-8221 or email walkeredge@webster.edu.